See you next Year for more comments, Enjoy new Year, and best wishes of good health , love and happyness. Very festive scene. vote. Happy New Year. Wonderful interior photo Alain. Like the warm glow from the tungsten lights. It goes perfectly with the scene. Vote. Marvelous shot. Happy New Year to you and yours. Bel intérieur, tous mes voeux ! Happy New Year Querido!! Terrific shot. GMV. I wish you a great year 2007! Alain, Happy New Year to you & your family. Fantastic dinner table, love it. Very Nice! Looks like you are having a lovely celebration there, Alain. A very inviting image. Happy New Year to you and your family. vote. Very beautiful setting with such a warm, welcoming feel to it! Happy New Year to you Alaine and your loved ones! Wonderful image with a warm inviting feel. Beautiful photo, very warm and inviting. Have a wonderful new year! Great indoors shot. Looks like large crowd expected. Wonderful shot, Alain. I would love to be there. Best wishes for 2007. Une table magnifique, Alain ! Mais tout le monde la déjà dit, en effet cest la première chose qui vient à lesprit en regardant ta belle photo. Happy New Years to you and your family!!! Beautiful dinner table. Happy New Year! Magnificent photo of this table setting........warm inviting atmosphere created! Vote!Merry Xmas and Happy New Year! Quelle belle table Alain, tu féliciteras madame. un très beau réveillon en perspective, quelle belle tablée! 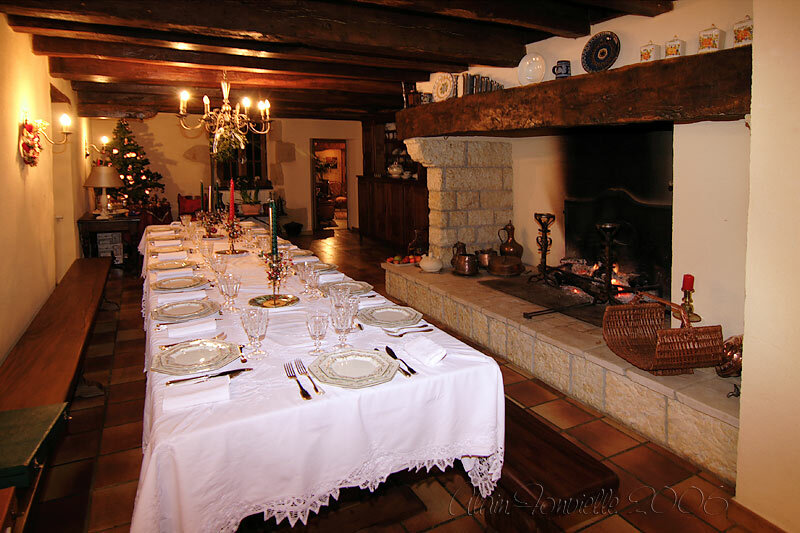 Fantastic table setting with the fireplace burning love the floor and the over head beams. Happy New Year to all of you, QUERIDO. Voted. Meilleurs voeux de santé et de bonheur à vous aussi. Mon ami, quoi dire si ce n'est Bravo pour ton année photographique. Ce que je peux te dire c'est que je t'ai souvent pris en exemple....Je suis sûr qu'on se rencontrera en 2007 !!! Thank you for the good wishes Alain. Please accept mine in return. if this is your home & your table it is beautiful & I wish you... Festoiement heureux ! !